Why Transcribe Strauss Four Last Songs? Composer, arranger, WWS oboist and music director emeritus Michael Purves-Smith provides unique insight into his thinking as he transcribed Strauss’ Four Last Songs, to be featured on our concerts on October 23 and 30, 2016. Why Transcribe Strauss’ Four Last Songs? Comments Off on Why Transcribe Strauss Four Last Songs? Our first set of concerts this season features our principal horn player extraordinaire Tony Snyder playing Richard Strauss’ Concerto No. 1 for French Horn. After our rehearsal yesterday, Tony reflected on playing this concerto. Here’s what he had to say. 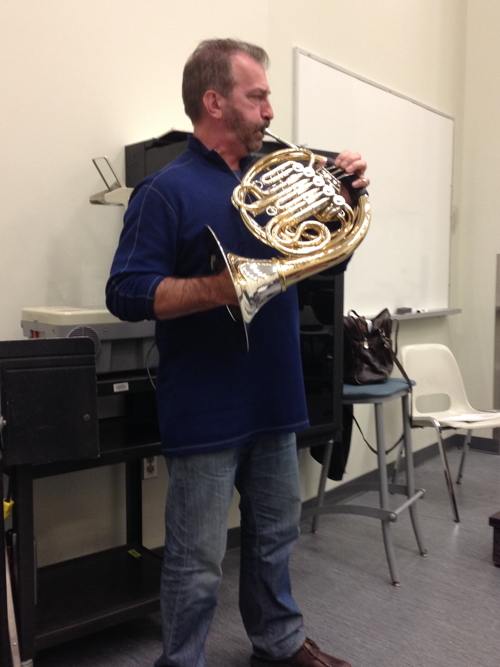 Soloist Tony Snyder rehearsing the Strauss concerto with the Winds.